Snow may be reminiscent of a European Christmas, but even in the 30°C South African summer heat I couldn’t resist making these Snowy Gingerbread Trees. They just look so Christmassy! With just a little extra effort, you can turn your Gingerbread Biscuits into stunning edible gifts or a beautiful centrepiece for your Christmas table. Not only do they look absolutely magical, but they taste simply divine too. This is a great recipe to get the kids involved in – they just love building the trees! 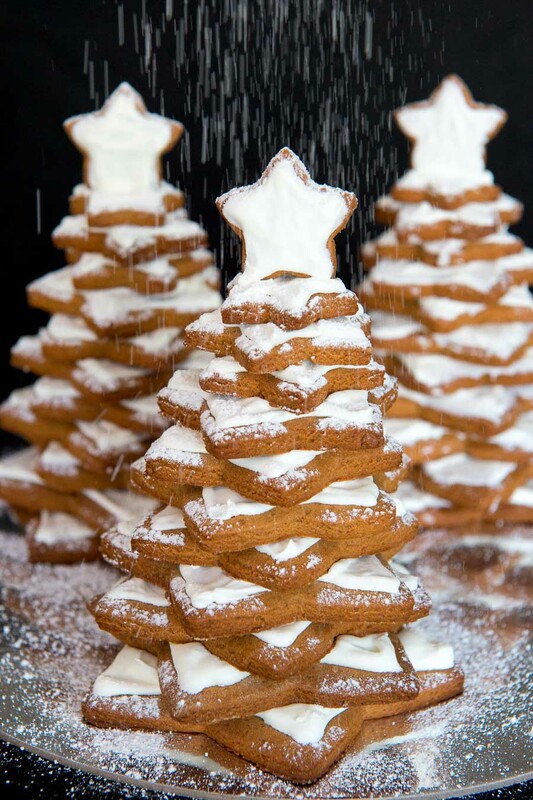 To make your snowy gingerbread trees, just follow the recipe for Gingerbread Biscuits, and cut the dough into various sized star shapes. I bought a set of 6 five-pointed star cutters from my local baking store, which works really well as the sizes follow on perfectly from each other. If you can’t find a set then buying a variety of star cutters would work too. You will need to cut out 2 of each star per tree, ending up with 12 stars in total per tree. 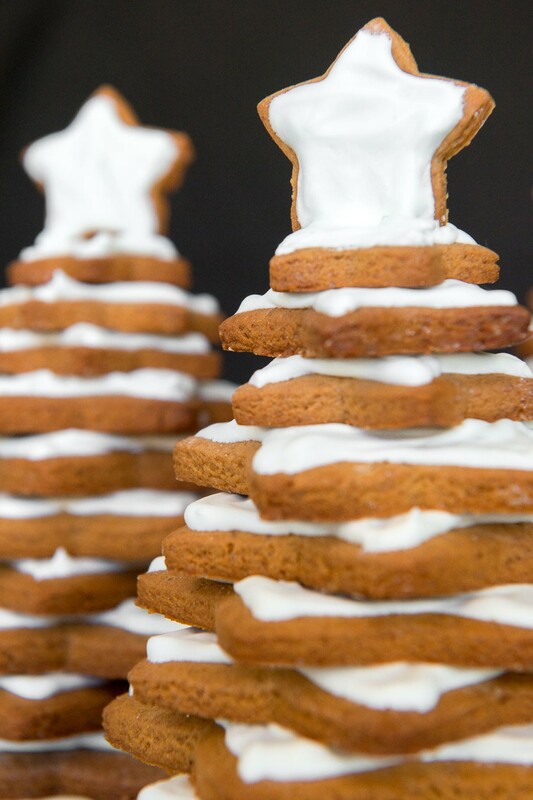 Then starting with the largest stars, simply spread a layer of royal icing over the surface each cookie, and place the one on top of the other, alternating the position of the points. Repeat this with all the stars, going from largest to smallest. Place the smallest star on top standing upright. For an extra snowy effect, dust with icing sugar. You could also decorate with silver balls or other sugar decorations before the icing sets. I was able to get 3 Gingerbread trees out of 1 batch of biscuit dough, but this will depend on the size of your stars of course. And there you have it – a delicious showstopper for your Christmas table!